The Su-22 is the export version of the Sukhoi Design Bureau's Su-17 Fitter series (the Su-22 shares the same reporting designator). 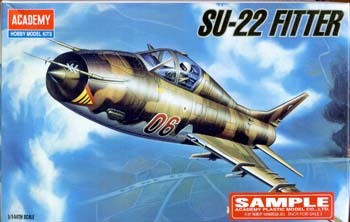 In fact, the Su-17/22 series are themselves updated versions of the original Fitter, the Su-7. The Su-7 was a workhorse in the Soviet Tactical Aviation, providing reliable and accurate air-surface combat capabilities. The wing of the Su-7 was swept sharply aft to provide a solid bombing platform at high speed with minimal drag. The main disadvantage of swept-wing aircraft is that take-off and landing speeds are excessively high. When swept-wing technology began to reach feasible prototype stages in the west, with the F-111 in the US, the Mirage G.8 and others, the Sukhoi Design Bureau decided to tak a low risk approach in its upgraded Su-17. The wing sweep mechanism was installed for the outer 2/3 of the wing, with the inboard section remaining in the highly swept profile of the Su-7. This allowed for all of the wing pylons to be attached to the fixed portion of the wing (eliminating the moving pylon problems). With the installation of a more powerful engine, the Su-17 and Su-22 were equipped with additional weapons stations and higher precision bombing technology, making the Su-17/22 a very potent bombing platform. 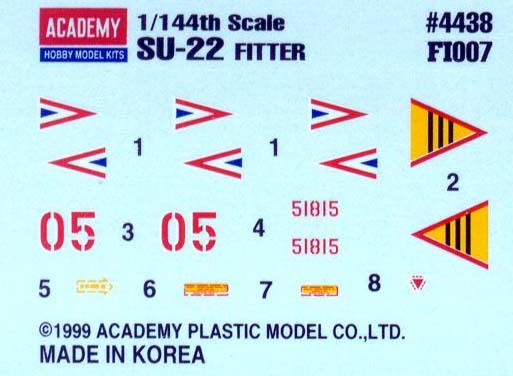 Academy has released the Su-22 in 1/144 scale. The shape and markings of the kit indicate an Su-22M-3 variant. 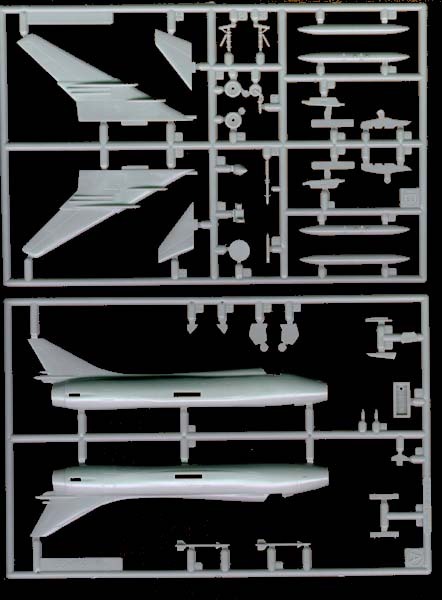 The kit is comprised of 41 parts, which include a good number of details. As might be expected in a kit of this scale, cockpit detail is limited to an ejection seat, floor board and instrument panel. The movable portion of the wings are molded in the inboard sections at 45 degrees. The kit includes a full compliment of external pylons, landing gear and gear doors, two external fuel tanks and two K-13 (Atoll) IR missiles. The molding of the kit is crisp, with scribed panel lines in key locations (not overdone), and no sinkmarks in visible locations. Even the detailing in the nosewheel well is present. Interestingly enough, the boxart depicts an Su-22 with a red 06 bort number, while the decals provide markings for red 05. The only national markings are for a Hungarian example. The kit looks like fun! 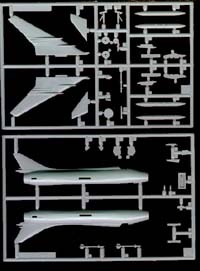 I recommend this project to any builder of Soviet airpower. Our thanks to MRC for this review sample!